The 15th Annual Green Building Conference sponsored by the College of Environmental Science and Forestry (ESF) in March will feature presentations by experts in the green building field. Jeff Speck, author of "Walkable City," will speak about "the hidden green" in creating walkable cities. Thomas Knittell, design partner of McLennan Design and a biomimicry expert, will discuss the role biomimicry can play in design. Speck is a city planner and urban designer who advocates internationally for more walkable cities. As director of design at the National Endowment for the Arts from 2003 to 2007, he presided over the Mayors' Institute on City Design and created the Governors' Institute on Community Design. Prior to his federal appointment, Speck spent 10 years as director of town planning at DPZ & Co., the principal firm behind the New Urbanism movement. Since 2007, he has led Speck & Associates, a boutique planning firm that specializes in making American downtowns thrive. He is the co-author of "The Smart Growth Manual" and "Suburban Nation." His latest book, "Walkable City," was the best selling city-planning book of 2013-15. Knittel is the design partner of McLennan Design, an architectural, planning and consulting practice focused on net-zero, low-carbon and living buildings. His past projects in the United States, Asia, Brazil, the Middle East and Haiti explore connections between people, place and ecology. He has used biomimicry-the "technology transfer" of natural systems to solve human problems-to inspire and inform the design process. Knittel holds a master's degree from the Harvard Graduate School of Design, is a certified biomimicry professional, studied at SCI-Arc and has received more than 30 design awards across a broad range of building types. He donates his time as the design leader for The William Jefferson Clinton Children's Center in Port au Prince (currently under construction), a new family learning center and orphanage funded by the USGBC designed to LEED Platinum and net-zero standards. It is a project he began at HOK and continues in his new firm. He is a registered architect in multiple states and a member of NCARB. The conference also offers numerous concurrent sessions on topics including age-friendly communities, reconnecting to the Erie Canalway and designing workplaces for health and wellness. The Green Building Conference will take place March 30-31 at the Marriott Syracuse Downtown in Syracuse. 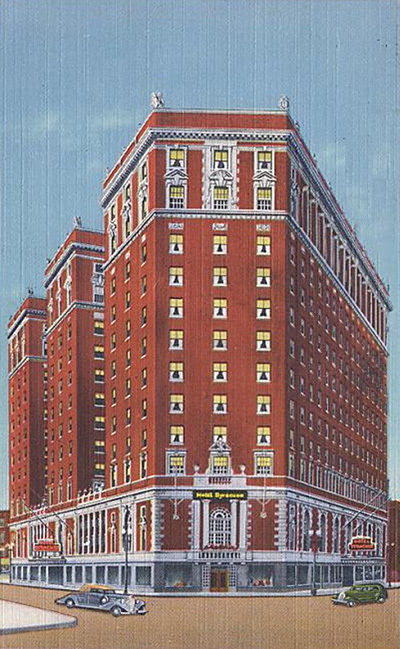 The hotel has been the site of extraordinary historic restoration and revitalization. The conference serves as a forum for green building research and development, best practices, and discussions on green building science, and operation and maintenance, as well as an opportunity for attendees to network with other green building experts, professionals and researchers. The conference is hosted by ESF in partnership with the U.S. Green Building Council New York Upstate and the Syracuse Center of Excellence in Environmental and Energy Systems. For more information and to register for the conference, visit the conference website at www.esf.edu/greenbuilding.